AKH, the German motor manufacturer bought by WEG last year, has patented a water-cooling system for high-speed motors which, it claims, will result in motors that are 20–30% smaller and lighter than conventional water-cooled machines. It is applying the cooling technology in a series of lightweight, high-torque motors that, it says, can achieve power densities up to 2.6 times higher than conventional water-cooled machines. The motors – available in efficiency ratings up to IE5 – can reach speeds of up to 12,000 rpm in frames that are one or two sizes smaller than standard water-cooled motors of a similar power rating. 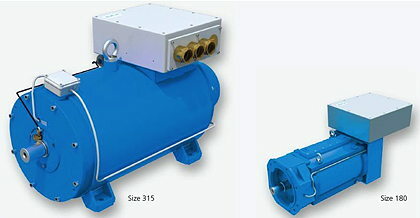 The image below shows a 300kW water-cooled motor in the new design with a 180 frame size (right) compared to a 315 frame motor with conventional water-jacket cooling (left) that has the same power rating. The cooling elements are integrated into the motor’s stator laminations. Water flows through channels inside the laminations, allowing heat to be removed directly from where it is generated. The laminations are formed from four layers of copper or aluminium which are created using a special process. The new design eliminates the need for the water jackets containing concentric steel tubes that surround conventional water-cooled motors. This, in turns, saves weight and eliminates the space needed for the jacket. AKH is offering its new motors in several different designs. These include induction motors (the UTTW series) covering the power range 24–240kW, with shaft heights from 112–180mm. There are also versions with water-cooled rotors (the UTTWp series), which can deliver up to 300kW with the same shaft heights. Finally, there are water-cooled synchronous motors (the USTW series) with the same compact design and power ratings of up to 440kW. As well as saving weight and space, AKH – also known as Katt ­– says that the new motors have low noise levels and will deliver long service lives. They can withstand 300% overloads for short periods. AKH expects the motors to be attractive for applications where their low weight and compact dimensions are particular advantages. These could include machine tools, mobile machinery, agricultural and forestry equipment, electrically-powered vehicles, test-bench technologies, and marine equipment. Initially, at least, the motors are being built to order and will have price-tags to match.